Much of the analysis of the Paris Climate Talks these last few weeks has focused on the less-than-ambitious plans 158 countries submitted in advance of the conference. Taken together, critics say, each country’s Intended Nationally Determined Contributions (or INDCs) would hardly make a dent in global greenhouse gas emissions. Even the most optimistic projections point out that these proposals will at best limit warming to 2.7 degrees Celsius, well above the 2 degree limit long agreed to as the threshold for catastrophic climate change and sea level rise. These criticisms are all valid to a certain extent, but only tell part of the story. The Conference of Parties in Paris is set to achieve a global consensuses on questions previous conferences have been unable to reach — from the collapse of binding contributions to disagreements over differential responsibility and impact. After 25 years of little meaningful progress, Paris represents a turning point. After Paris, future climate summits will have to proceed from this baseline. Businesses will know that governments worldwide are serious about setting aside their differences on climate change, and will unleash a corresponding wave of investment. Meanwhile, cities, states and regional governments have already gathered to share policy proposals and set far more ambitious plans for sustainable development than their respective national governments. Perhaps most importantly, after Paris, citizens across the globe will have concrete promises to point to when they inevitably demand that their governments take actionable steps toward defeating the greatest existential threat humanity has ever faced. Each past round of high-level climate negotiations have stumbled over a few key areas of disagreement, from what long-term goals to set to the different levels of responsibility each nation has in reaching them. The issue of “differentiation,” as climate negotiators call it, is one of the most prickly. For over two decades, rich countries have pointed toward growing emitters like China and India, accusing them of not doing enough to cut pollution, while developing nations point out that the US, EU and other developed nations bear the largest historical responsibility for greenhouse gas emissions. Even as the need to cooperate with one another to achieve a working deal is abundantly clear to all, past deals have fallen through when one or more parties skipped out on a deal to pursue short-term gains. Scholars of international relations have long used game theory to describe such strategic scenarios in which the long-term payoff of cooperation is greater but potentially more risky than seeking short-term gain, and these insights have been applied to the climate question. One such game analogous to the climate dilemma is the “stag hunt,” wherein two hunters can coordinate their efforts to capture the proverbial “stag” to the greater benefit of each, or they may abandon the common goal to shoot a “hare” and satisfy their own short-term needs. Each possibility is ranked numerically. The optimal outcome for both the player in the row and column is to abate emissions; no change in strategy could produce a better outcome. The “maxi-min” equilibrium is one in which a player attempts to cut their losses in the worst-case (or “maximum loss”) scenario. When one side chooses to continue polluting, the other is likely to as well. Assuming that this is a one-off game, wherein the players know little of the others’ plans and have had no coordination beforehand, it would be reasonable to assume both parties would opt for the “maxi-min” strategy, which is to say that they would keep polluting. Fortunately, international climate negotiations are not a one-off game: The players are now well aware of the stakes involved, and each is deeply familiar with the others’ strategies. Once a consensus is reached, any strategy that departs from the established consensus that climate change is an existential threat is a strategy that goes against the interests of all. In that light, those 25 years of failure would have to be reevaluated. As Bloomberg reports, climate diplomats have nearly a thousand decisions to make and 158 countries to negotiate between. Reading through the Google Doc that serves as the only written record of the talks as they happen, it is evident that the current negotiations are moving forward more quickly thanks to lessons learned from past negotiations — from the way discussion can move without parties “restating known preferences” to the way facilitators have structured negotiations over text differently than at past conferences. “Everyone has learned the lesson of Copenhagen… We have never seen at this stage of the conference such a feeling of comfort and pleasantness,” Venezuelan envoy Claudio Salerno told Bloomberg. Venezuela, a net oil exporter, worked with others to block a deal at Copenhagen back in 2009. Differences in opinion will persist, and national INDCs will not do nearly enough to cut emissions, but any deal that succeeds in creating a consensus approach to addressing climate change, however modestly, will represent a major breakthrough in climate negotiations. The key elements to keep in mind are that these negotiations are a) an iterative process likely to be repeated in five years and improved upon (a final deal will include what are known as a “ratchet mechanisms” for individual countries to ramp up the efforts outlined in their INDCs), and that b) a strong message of global political consensus on tackling climate change (including provisions on climate finance and research and development) will have a major impact on the global economy in the coming decades. This point cannot be stressed enough. In today’s age we are accustomed to thinking that economic planning is a relic of the past, something that the Soviets used to do in the 1950s. But this is simply not the case — everyone from consumers to cities to state governments and Congress has to plan ahead and budget their expenses given reasonable expectations of what the economic future looks like. As University of Cambridge economist Ha-Joon Chang points out, we live in a planned economy. Plenty of capitalist countries use “indicative planning” to set strategic investment targets in areas like infrastructure development and exports. “Sectoral industrial policy” often sets goals for the development of the economy in a certain industry, such as the automotive industry in the post-war United States. And all capitalist countries invest sizable amounts in research and development to plan the nation’s technological future. There’s a reason the Congressional Budget Office reports bills’ effects on revenues and expenditures in ten-year projections. Businesses also have to plan, as much if not even more so than governments, and right now, their outlooks are shifting rapidly. As Michael Liebreich, Chairman of Bloomberg New Energy Finance’s advisory board told Bloomberg News: “the agreement is about direction-setting. What it will do for business is it will give them confidence that, yes, we’re going in that direction. You can make investments, you can plan, you can hire staff.” Again, a successful deal in Paris will function in much the same way as indicative planning does, as a signal to the global economy that sustainability, renewable energy and a total energy transformation are the wave of the future — that they will over time be more profitable than investments in fossil fuels. To be clear, companies are reacting to other macroeconomic factors at play. As China’s growth starts to slow down, commodities prices have dropped to levels not seen in decades. Natural resource suppliers put serious investments into meeting exponentially rising demand in the developing world. Now that the pace of growth has slowed, markets are oversupplied, leading to the end of what some call a “commodities supercycle” when those prices were much higher. Oil was one of the last commodities to see its prices collapse, and contrary to some expectations, renewable energy sources remain competitive and may even receive a boost thanks to the collapse of oil. Oil exploration being an immensely costly enterprise, new investment in places such as the Arctic makes even less sense than ever. We’ve seen the political effects of this already as projects such as the Keystone XL pipeline and further Arctic drilling have been cancelled, decisions spurred in part by their lack of profitability. Now, what this graph does not illustrate is that much of the money “missing” from that gap is currently being invested in fossil fuels to the tune of $5.3 trillion dollars a year in worldwide in subsidies alone, to say nothing of the trillions wasted on wars that made the US and its allies no safer. Should we choose to allocate the necessary funds, we could find corresponding room in the budget. The problem, in any case, has always been political and not economic, and the challenge after Paris will be to push governments to not only take negative steps to prevent further environmental degradation, but to take positive steps to invest in the future as well. 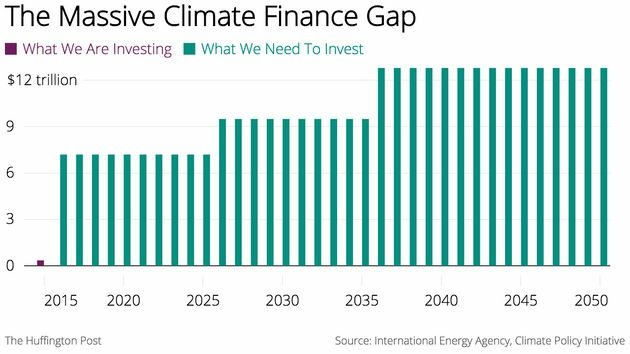 It is abundantly clear that investing in the transition to a zero-carbon energy economy will be widely beneficial long term. And again, the success of the fossil fuel divestment movement and the mobilization against the Keystone XL pipeline have both shown that the climate justice movement can make these changes happen even under conditions of crippling partisan gridlock. The fact that so many countries with such widely varied interests have come this close — against all odds — to reaching a consensus isn’t a testament to their own will so much as a testament to the decades of work by the environmental movement, as well as the frustration and pressure put on governments by their general publics. So, despite its naysayers, this deal has the potential to unleash a scientific, economic, and political revolution of Copernican proportions. The work will be far from finished, but it would be impossible to imagine a way forward without it. America of course will not play the game because it is exceptional and the rules of others don’t apply and the GOP does not believe in climate change. One can only hope some sort of BINDING agreement can be reached. There are other immediate threats,(middle east), but the climate crisis is a long term problem that needs addressing now or it might devolve into global chaos. Then it would be really too late to help the planet recover.